But hey… this ought to be celebrated throughout the genealogical community. We should call it Family History Day, because — without laws and the records created because of laws — there sure as heck wouldn’t be much family history for any of us to find. Our theme can be No Laws, No Courts, No Records. Think about it for a minute. Think of all the bits and pieces and clues we use to piece together the stories of our ancestors. So very many of the records we rely on were created because of some legal requirement. I have a marriage bond for Boston Shew and Elizabeth Brewer in 1816 in Wilkes County, North Carolina.4 It exists because the law required it. I have the 1895 Chicago birth certificate reflecting when and where my father’s aunt gave birth to her first and only child, in Chicago, in 1895.5 Why? Because the law required it. I have death records for two great grandfathers, both born in 19th century Texas6 because the law required the deaths be recorded. I have the passenger list for S.S. George Washington, the ship that carried my father and his parents from their home in Germany to their new home in America in 19257 because the law required it. I have my grandmother’s birth certificate from Germany — attached to the visa application the law required her to fill out to come to America.8 I know where they lived in 19309 and, as of 2 April when the 1940 census was released, I know where they lived in 1935 and 194010 — because the law required those censuses to be taken. And I have that affidavit filed by my fourth great grandfather David Baker outlining his service in the 3rd Virginia in the Revolutionary War where he mentioned the death of his brother Richard at the Battle of Trenton11 that I wrote about this past Sunday.12 Why? Because, if David was to qualify for a pension, the law required it. I can’t imagine doing family history research without the records required by law. It’d be a nightmare. It probably wouldn’t even be possible. 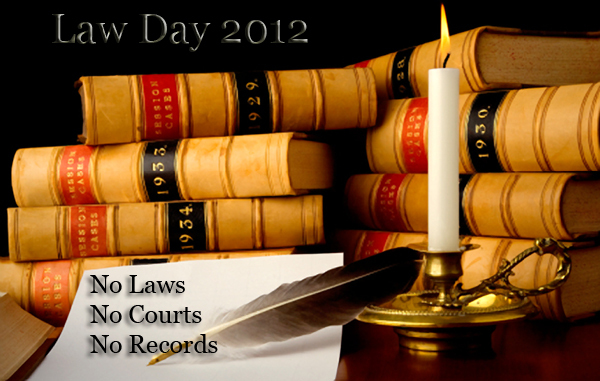 So let’s hear it for Law Day. For a genealogist, it’s the best holiday there is. Judy, you are right as usual. So right, in fact, that in order to celebrate properly I should have called off from the day job today. Could you remind me a day or two earlier next year? Thanks! Make you a deal: you call in and get my boss to give ME the day off, and I’ll call in and get YOUR boss to do the same! One of us is a lawyer. Guess which one is more likely to be convincing enough to achieve the desired result? Love those legal requirements! They’ve helped me learn more about my ancestors! Thanks Judy for a great post. And, anyone who can sell law details to genealogists can sell anything!! You overrate my abilities, Celia. I swear: I couldn’t sell a meal for a nickel to a starving man. Whatever DNA is required to be a sales person, I got none of it!